Most plants can grow in Gro-Slabs but they are particularly good for growing large vine crops such as tomatoes or cucumbers. For plants growing outdoors during mid-day sun Gro-Slabs provide a good water buffer. 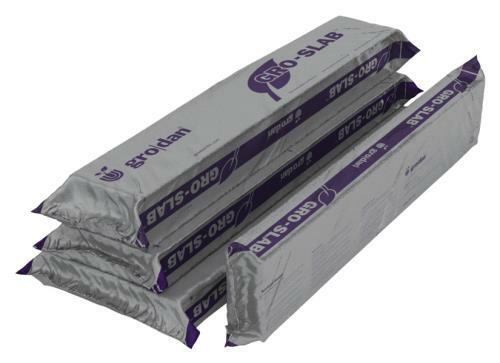 The 12” Gro-Slab is considered a wet slab due to its horizontal fibers. It holds more water than other slabs and can support more plants than any stone wool slab. The rest of the Gro-Slabs are all comprised of vertical fibers, which allow for faster drainage and a drier slab. 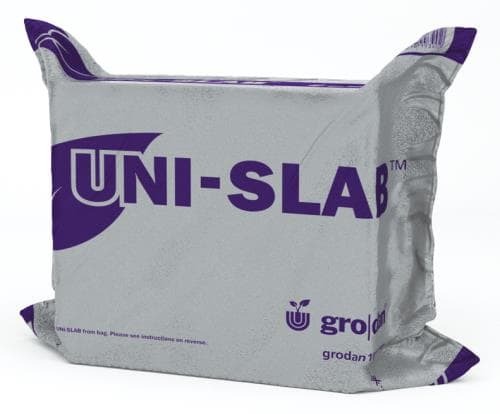 If your time is limited and you wish to simply hand water twice a week or if you have never used a GRO-SLAB™ and want to experiment with a small one first, then the UNI-SLAB™ is for you. The UNI-SLAB offers a low-maintenance, simple way for growers to have fresh herbs, healthy greens or one larger plant in a small area. By keeping the wrapping on the stone wool, nutrients and moisture last longer by slowing the evaporation process. The best part of the UNI-SLAB is that it is self contained. So if growing one large plant and disease occurs, the roots won’t spread the disease to other plants. Available in Case Quantity by Request. Gro-Slabs provide the final stage for growing a spectacularly large plant. Transplant your Gro-Block™ plant onto a slab just like professional growers. They come in clearly marked biodegradable UV resistant sleeves for comfortable handling and algae prevention. 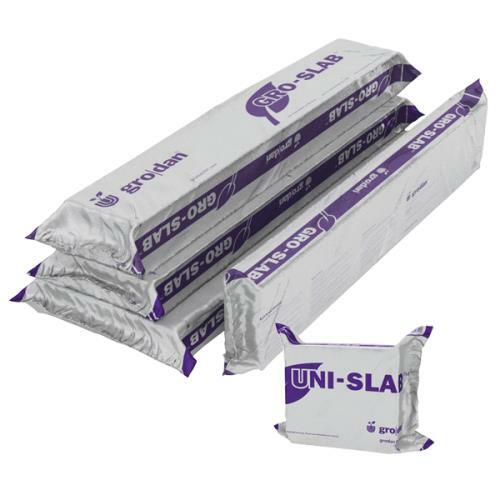 Uni-slab™ – All plant roots are protected and contained for the life of the plant. Due to its size, the Uni-Slab™ is perfect for one large plant. Uni-Slab ™has the benefits of a slab with the versatility of a block. All Gro-Slabs have vertical fibers except the 12 inch Gro-Slab, which has horizontal fibers. 6"x4"x36", 6"x3"x36", 8"x3"x36", 12"x3"x36", 9.5"x8"x4"